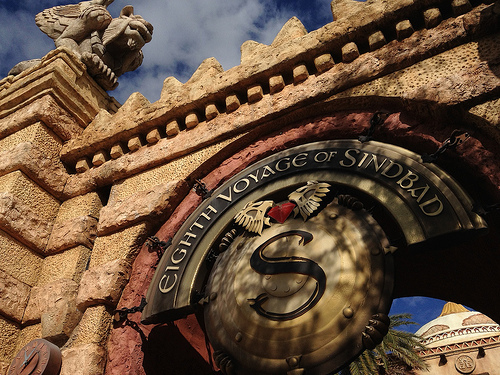 Too early for Sinbad, originally uploaded by Erin *~*~*. I want to see this show one last time. I’ve got a feeling it’s going to make way for Diagon Alley… Just a hunch! Familiar characters just hanging around, originally uploaded by Erin *~*~*. 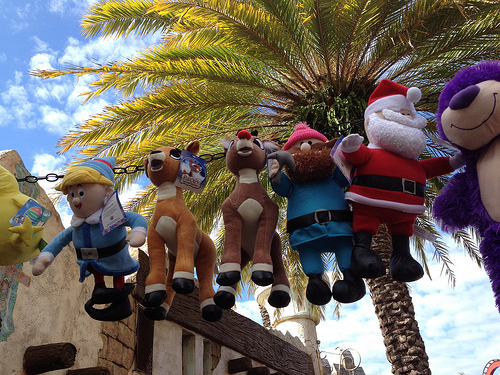 Didn’t realize the Rudolf characters were a Universal property. Hey, where’s the Bumble? Birds find the oddest places to nest, originally uploaded by Erin *~*~*. 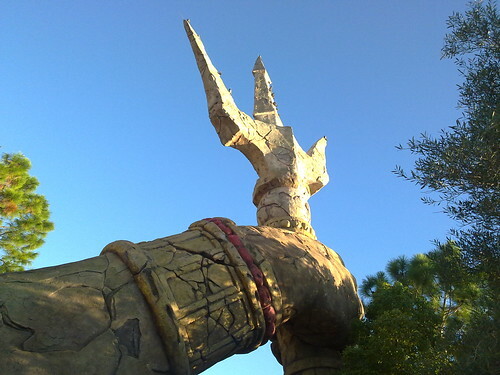 The Big Fork at IoA, originally uploaded by Erin *~*~*. Paying a visit to Poseidon, originally uploaded by Erin aka Tink*~*~*. 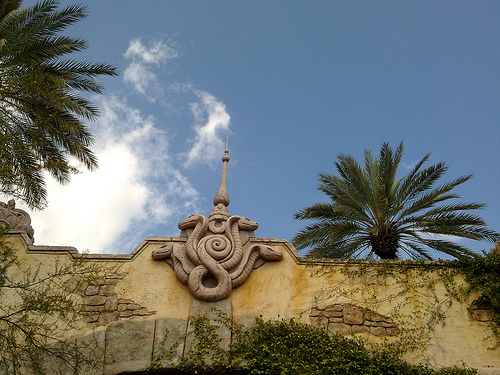 When they expand The Wizarding World of Harry Potter, I wonder what will happen to this BEAUTIFUL temple? I hope TPTB discover a way to repurpose it in some way. Would be a shame for it to be demoished, even to make way for Diagon Alley. 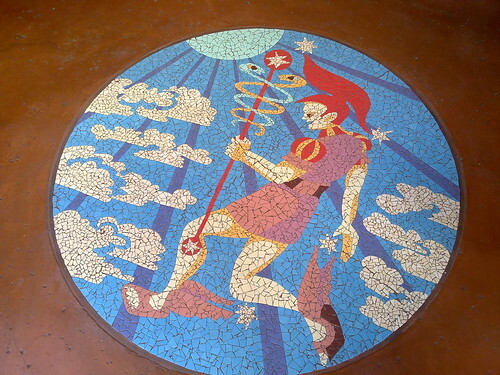 Mythos mosaic mural, originally uploaded by Erin aka Tink*~*~*. 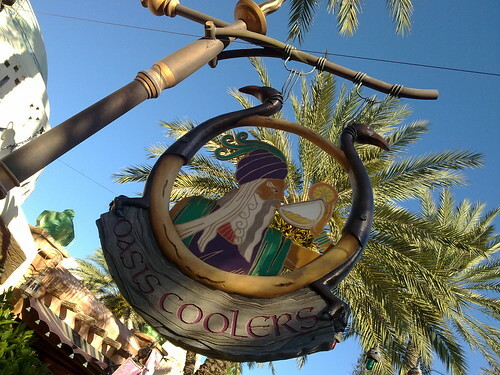 Wizarding World of Harry Potter is over capacity, originally uploaded by Erin aka Tink*~*~*. 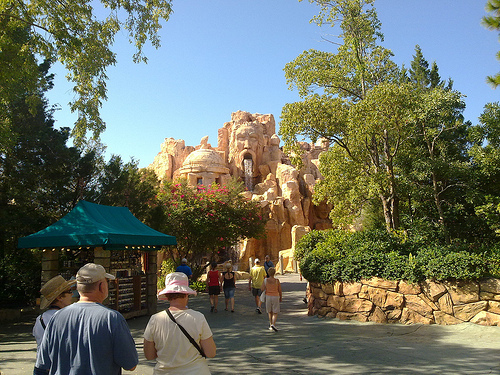 They are handing out-window-of-time tickets just to get into that part of the park, never mind on the rides. we’re going to get some lunch. That flame looks good today, originally uploaded by Erin aka Tink*~*~*. “Fire and Ice”, the feet-dangling-Erin-terrorizing double roller coaster, as been re-themed to reflect the Dragon Challenge in the Triwizard Tournament, an event around which Harry Potter and the Goblet of Fire was centered. Still standing is the “Poseidon” themed section of the Lost Continent, including the award-winning Mythos restaurant. 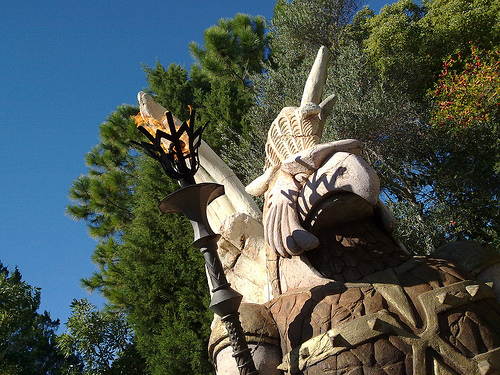 Inexplicably, I have always managed to miss dining at Mythos; one thing or another has prevented me from joining any of my friends and family there, thus far. 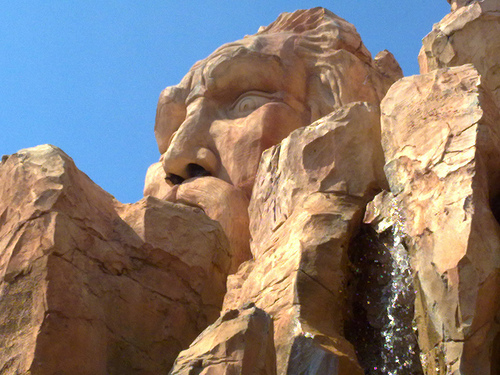 So, if there is such a thing as a theme park “bucket list”, this would be on mine – lunch at Mythos. I have the feeling I’d better get to it sooner rather than later, before what remains of the Lost Continent becomes truly lost! 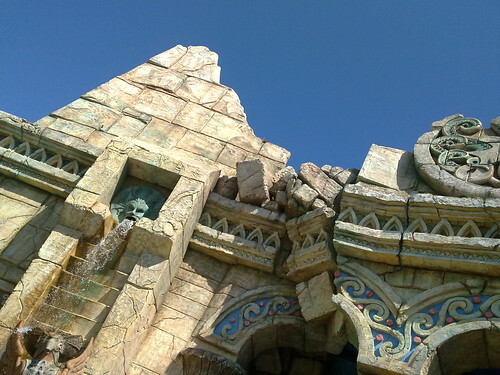 Speedwalking throu IOA Lost Continent, originally uploaded by Erin aka Tink*~*~*. i am making good time! 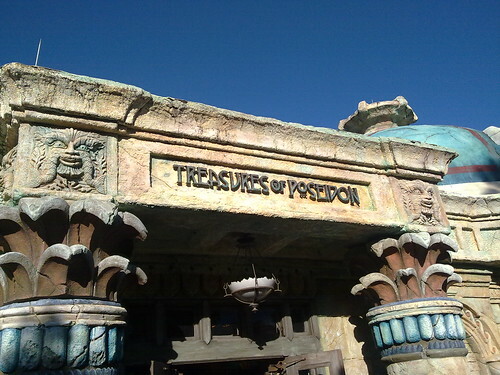 Is Poseidon the same as King Triton? 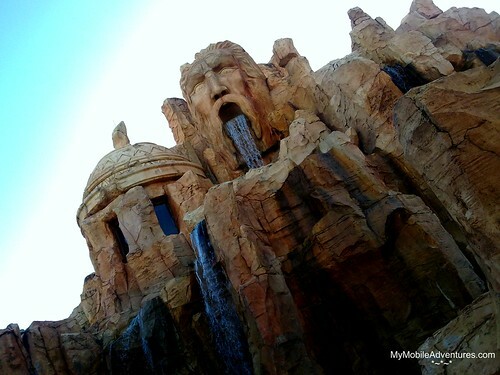 #IOA #Universal, originally uploaded by Erin aka Tink*~*~*. Are they brothers? Is one the Greek version and the other the Roman version? 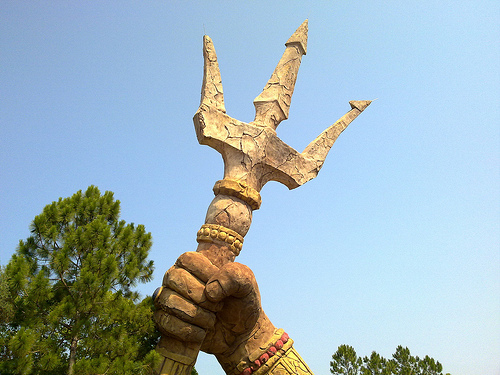 They both seem to have one of these triton spear things. Ah shopping without a line to get into the store 🙂, originally uploaded by Erin aka Tink*~*~*. Exited the Wizarding World of Harry Potter – for today, originally uploaded by Erin aka Tink*~*~*. I think they’ve made an error of scale in there. I know small and cozy is what merry olde English towns are like but it’s too small in there for the size of the crowd. You can’t even shop without standing in a line first. I didn’t even try to get near the castle. I’ll do that with the gang on Sunday.